Plans to demolish Shoreham’s yacht club and build a new and improved clubhouse at the Brighton Road site have been given the green light by councillors. The proposal, which was considered by Adur District Council’s planning committee on Monday, involves demolishing the existing building and creating a new two-storey clubhouse set further back from the road. This will pave the way for the council to go forward with their plans to build new flood defences and a pedestrian and cycle route along Brighton Road. Read more about the council’s plans for Brighton Road here. The committee heard that planning officers had had some concern about the impact the new building, which would be higher than the existing clubhouse, would have on views on St Mary de Haura church. However, officer James Appleton said further reports showed that the main tower of the listed church would still be visible from Shoreham Beach and would remain the dominant structure on the skyline. Mr Appleton said the developers had agreed to look at using a darker, matte colour for the roof of the building so that better fitted in with the surroundings. 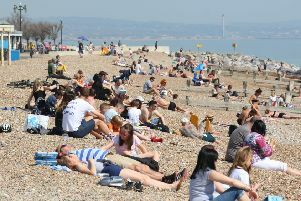 The Environment Agency, Natural England and Sussex Wildlife Trust had raised objections to the plans after an ecological report showed the plans would cause a direct loss of at least 60 square metres of intertidal mudflat habitat and four square metres of salt marsh. But Mr Appleton said the developers had since put forward a ‘comprehensive package of measures’ to mitigate this loss and said that, while the consultees had not yet given final confirmation, he was confident these measures would address the issue. Terry Kinch, commodore at the yacht club, told councillors that the building would have both communal and individual changing facilities for people with disabilities and would continue to be the home of Sussex Sailability, a volunteer organisation which gives enables disabled people to sail. He said the flood defence scheme, which demolishing the existing clubhouse would enable, was ‘going to help protect our residents’. After the meeting, Mr Kinch said he was ‘delighted’ the scheme had been accepted. “I’m really pleased, we’ve done a lot of work to make sure it fits into the surroundings,” he said. He said construction of the new clubhouse was anticipated to begin in mid-January. The old clubhouse will then be demolished, allowing for the council to begin work on the flood defences and foot and cycle path.